You and I cannot go to China and start buying soybeans or gold or whatever we want. It is very difficult. 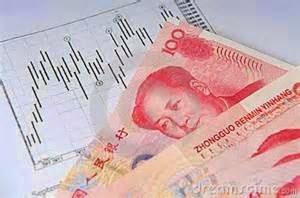 It could happen but it is very rare and difficult for non-Chinese to trade in Chinese commodity markets. Yet, Dalian, the commodities exchange in Dalian, trades more soybean contracts than Chicago and Chicago invented it! The volume in these markets in China is staggering and they are still closed to the outside world. You cannot imagine how big they are going to be once they become real international markets. They are going to take the business away from Chicago. Chicago, London, and New York, will no longer be the dominant markets in the world. China will take away most of their business. That is definitely going to happen. By the way, before WWII, the biggest financial market between New York and London was Shanghai, and it will be again eventually. To your point about Chinese stocks, yes Chinese stocks have been going up again for a number of reasons, one of which is that China, as it becomes more and more open, they realize that you need financial markets if you are going to become a big economic player in the world. You can’t have closed markets and still be a big player in the world. They know that and they are opening. They aren’t opening as fast as I would, I would’ve done it last year, or yesterday, or tomorrow! But for some reason they are doing it too slowly, in my view. But it is happening more and more. Can you have stocks and commodities go up at the same time? It is rare, in history that happens. Normally, you have commodities going up in their own bull market and stocks not doing well and vice versa. It can happen, anything can happen in financial markets, you can have bull markets in stocks and commodities. One reason you have bull markets in stocks when commodities are down is that the cost of goods and inputs are down when commodities are in bear markets, so companies can be profitable. And vice versa when commodities are in bull markets, it is more difficult for companies to be profitable and that is usually why they do not go together. China, given the fact that it is and expanding, growing, and new economy, could be different. Will it be different? I don’t know but I am optimistic about some economies and less optimistic about others at the moment. Longer term I am still optimistic about commodities, certainly in China. Many Russian bonds are under sanctions, and I can't just pick up the phone and buy them. I as a US citizen and many other citizens of Western countries can't legally buy the majority of Russian sovereign bonds. It's absurd. I am suspicious [about Eurobonds] because I'm not that optimistic about the euro, and they will be in dollars or euros. If I buy Russian bonds, they will be in rubles. If China's market goes down low, I would buy there. I am looking to invest in Kazakhstan, where there are very dramatic changes taking place, positive changes. It's difficult for an American still to invest in Iran, but the Japanese can and should be investing in Iran. The world is going to have to face the problems and take the pain, and it's going to be painful especially in Japan. But you let people go bankrupt, you clean up the system and you start over. Q: What is your take on China's slowdown? Rogers: Chinese trade with everybody and their trading partners are having problems. Japan is in recession, parts of Europe are in recession, Russia, India is slowing, America -- some parts of America are having problems. So when your large trading partners have problems, you have problems, if you deal with those countries. So, parts of the Chinese economy are going to continue to go down. China has debt now. In 2008, when we had a problem, China had a lot of money saved up for a rainy day and they started spending it, which helped save the world. But this time, China has a lot of debt, too. Some parts of the Chinese economy, they were going to be extremely strong. China has a lot of pollution. And the government is now spending a lot of money to clean up China. So if you are in pollution cleanup ... you [are in a position] to make a lot of money. China is spending a lot of money now on health care because they don't have much health care or good health care. So if you are in the right area in China, you are going to boom. Q: How do you rate the economic policies of Japanese Prime Minister Shinzo Abe? Rogers: The prime minister in Japan says, "No, no, we will print unlimited amounts of money." Now, maybe he is right. Maybe printing unlimited amounts of money forever -- there is a good solution. Maybe debasing your currency [and] driving the debt out is the right solution. I think history will not judge if that's the right way. I am sure Mr. Abe is a very nice person, a very smart person. But I don't think he is doing the right thing for Japan. Negative interest rates cannot work and will not work. There are several bureaucrats and academics who are trying negative interest rates, and they say, "Well, if we make people spend money, they think we will be OK." Well, it can't [work]. The way you build an economy is with savings and investing. Consumption is wonderful for a while, but you have to have a basis of savings and investing before you have the consumption. Q: In the current circumstances, where would you invest? Rogers: I want to buy more Russian government bonds, short-term government bonds. They have very high yields in rubles -- not in dollars. I want to buy more Russian stocks, but I am too busy. If China's market goes down low, I would buy there. I am looking to invest in Kazakhstan, where there are very dramatic changes taking place, positive changes. It's difficult for an American still to invest in Iran, but the Japanese can and should be investing in Iran. There are some places in the world where good things are happening. [With] American stock markets near an all-time high, I don't want to buy [in] America. Q: How do you assess the state of the global economy? Rogers: I am not optimistic about the global economy for the next couple of years. Japan is already in recession, some parts of Europe are suffering, some parts of America are suffering and that's going to get worse, in my view, because there is nothing to make the world get better. In America, we've had seven years since our last recession. That is unusual because in America, normally every four to seven years, throughout history, we have had an economic slowdown. So it's overdue. It doesn't have to end in seven years, but we have many excesses which have taken place in the world economy, caused by very low interest rates. And the American central bank is making many, many mistakes by having interest rates so low and by printing so much money. And then the Japanese central bank and the European Central Bank, and the British central bank, all did the same thing. So we've had an artificial situation based on printed money and huge amounts of debt. [The Federal Reserve's] balance sheet was $800 billion in 2008. Now it is nearly $5 trillion. I expect the American economy to be in recession sometime in the next year or two. Q: If printing money is not the answer, what kind of economic policies would you like to see? Rogers: In the early [2000's], America had this kind of problem. America raised interest rates, America balanced the budget and had a horrible two years. But then America had the best economic decade in our history. So, the only solution I see is to admit our mistakes and now face those problems. Politicians don't want to do it, central banks don't want to do it. They say just keep printing money, keep borrowing money, keep building up higher and higher debt and everything will be OK.
We are going to have serious problems in 2016 and 2017. It will be worse than 2008. I expect markets to collapse like they did in 2008. It started in the middle of 2014 and that has been going worse and worse. I don't know when the market will hit rock bottom but probably next year will be the worst. It's going to be the U.S. again because America is the largest debtor nation. But this time, Portugal is going to go bankrupt, Italy is going to go bankrupt and the U.K. is going to collapse. It's going to happen in a lot of places. The debt was not much higher everywhere in the world in 2008. Then much of Asia and China had a lot of money saved up for a rainy day. They started spending when it started raining. But China has a lot of debt itself now. Singapore is not in as good shape as it was in 2008 and 2009. Korea has a lot of debt. Even Asia is not able to help as it did last time. So the problem is going to be much worse. We need to clean out the system. There is a huge amount of debt and money printing built up over the past 40 years. The sooner we clean out the mistakes, the sooner and better we start over. In 2015, twice as many stocks in NYSE were down as up. The average was flat but that was only because of nine or 10 big companies. They kept the averages up. The average is different from breadth. Breadth started deteriorating in the middle of 2014. It has been going down for 18 months because investors know something is wrong and they are taking their money out. Markets are frequently smarter than all of us. No matter what measures you use worldwide, we won't have a proper recovery because it has been artificial. It's based on a gigantic amount of money printing and debt spending all over the word, especially in the US. Could we be nearing the end game ? Since the system was not able to clean itself and since it's all artificial, we are facing a serious problem. In the U.S. we have economic recession every four to seven years and we are going to have one. They have tried to stop collapse several times and they have stopped it. They are going to try to stop it this time and we will have a few rallies but basically we are coming to the end and it's going to be very serious. So this is a terrible system economically, and terrible morality. But they don't care about morality. It’s been seven years, eight years since we had the last recession in the US and normally, historically we have them every four to seven years for whatever reason — at least we always have. It doesn’t have to happen in four to seven years but look at the debt, the debt is staggering. Japan is in recession, China is slowing down, half of Europe is in recession. If you look at the payroll tax figures in the US, you see they’re already flat. Don’t pay attention to the government numbers, pay attention to the real numbers. Midas Letter: Do you think that there’s a chance that there’s a potential for large political upheaval on a global scale sufficient that governments could be toppled, resulting in a wholesale realignment of the geopolitical order in the current turmoil? Jim Rogers: James, it’s not a chance, it’s a certainty. I was going to say a probability, but in reality, you see what happened the last time around: we had governments fail, we had countries fail, Tunisia, Egypt, lots of countries absolutely failed. Iceland failed, we’re going to have more of that and it’s going to be worse next time around, because the debt…James, we had problems in 2008 and ’09 because there were such high levels of debt. Well, the debt has gone through the roof since 2009, all over the world. Even China, which had little debt in 2009 and ’09 and now has lots of debt, they could help rescue the world back then, but now even they have debt. Not as bad as Italy or America or someplace, but even the Chinese have a lot of debt now. So it’s going to be a big mess. Midas Letter: Yeah. See, I find that interesting, that, you know, so in this phase – the last time, in 2008, it was small sort of fringe countries that failed, but now we have the largest debt problems in the biggest economies. The G7 is the most debt-ridden and arguably the most susceptible to complete collapse of confidence in their ability to repay debt. That, to me, is really telling. So, how do you see China’s position in all of this to come? Jim Rogers: You make a good point. Let me just go back, and you should get out – your listeners should get out of list of the G7 and you’ll see what they say: oh gosh, if those are the best, we’re in serious trouble! Japan, Italy, I mean, these countries all have – America, Britain, they all have huge amounts of debt now. Much higher than 2008. Sorry, go ahead with your next question. Midas Letter: I read recently that – Karl Bass was predicting that China was going to see an order of magnitude up to four times greater in terms of losses in its stock market in this current deflationary phase. What do you think China’s position in all of this is economically? How much at risk are they? How much in the driver’s seat are they, because they’ve got so much US dollars in their reserves? Jim Rogers: Well I said before that even China this time around is going to be affected, because they’ve got a lot of debt too now. They’re still the largest creditor nation in the world and they’re less a problem then we are, but everybody’s going to suffer; there’s no way, the main culprit is Washington, DC, to repeat what I said earlier. But who cares, because we’re all going to suffer. It doesn’t matter if you’re in Portugal and you’re suffering, if you say well, it’s all because of Washington, you’re still suffering. China’s going to suffer. A lot of the countries – I mean, Japan is in recession, the Japanese government will tell you that. Well, that’s one of their largest trading partners. Much of Europe is in recession. When your trading partners are in recession and having trouble, you have trouble too. So China is certainly going to suffer, and there will be bankruptcies in China. At least the Chinese government has said they will let people go bankrupt; I hope they do, it will be good for China, it will be good for the world, rather than propping up zombies.